I am not one of those people who play around with recipes to see how they work first, I just jump in and either sink or swim. This cake was no different. As you may know, I created this cake for my daughters bake sale (read that story here) and was making three different cakes. Not as difficult as it sounds being as two of them I have made so many times that I know the recipe by heart, but this one was a little trickier. The unknown can always cause a little stress. First off, I have never made a bundt cake, vegan or not so I wasn’t sure how my cake recipe would transfer over. Secondly, I had only enough coconut on hand for one attempt at roasting it and I was terrified of burning it. Also, I forgot until I was done that Samoas had a layer of chocolate on the bottom. Finally I knew it was already going to be a long day and I was smart enough to accept the fact that I would not have time to make my normal caramel recipe. *No worries on the bundt cake. It came out beautiful (as did all the cakes yesterday which is a rare event.) The bottom was a little uneven so I was able to cut off some to taste it. DELICIOUS! *On the shredded coconut front. If you have ever roasted coconut before you know it is easy to burn. With so much else going on I opted to pull it out at 7 minutes which turns out was a little too soon. It tasted great but I would have preferred it a more golden brown color. *Chocolate on the bottom could be easily achieved by adding a layer of melted chocolate over bottom of cake and letting it harden before flipping. *And the caramel. I found a recipe for coconut oil caramel which was quick and sounded great but it separated when it got cold so it did not keep the color one thinks of when dreaming of caramel. Next time I will make my normal caramel recipe. Over all, each part of the cake tasted great so I am sure it will taste amazing I just didn’t achieve the aesthetics I was hoping for. Preheat oven to 350 degrees. Lightly grease a 9″ bundt cake pans. In a large bowl mix flour, salt baking soda, baking powder, and egg replacer. In a separate bowl mix sugar, oil, applesauce, milk and maple syrup. Slowly mix sugar mixture into flour mixture and stir until well blended. Pour batter evenly into the pan. Tap bottom of pan to get air bubbles to the top. Bake for 45 – 50 minutes. Cake will pull away from side when done (stick a knife or skewer in it to make sure it comes out clean.) When done let sit for approximately 10 minutes or until cool enough to touch pans with bare hands. Flip onto cooling rack. Let cool completely before icing. Preheat oven to 300 degrees. Spread coconut in thin layer on a cookie sheet. Bake for 5 minutes and check. Continue to check every couple of minutes. I read that it is easy to burn so keep an eye on it. I left mine in for 7 minutes. Remove from oven when it begins to brown and set aside. If you choose you could brown more than I did. In mixer blend coconut oil, milk and syrup until smooth. Slowly blend in powdered sugar. once smooth spread a thin layer over the entire cake. Mix roasted coconut into remaining icing. 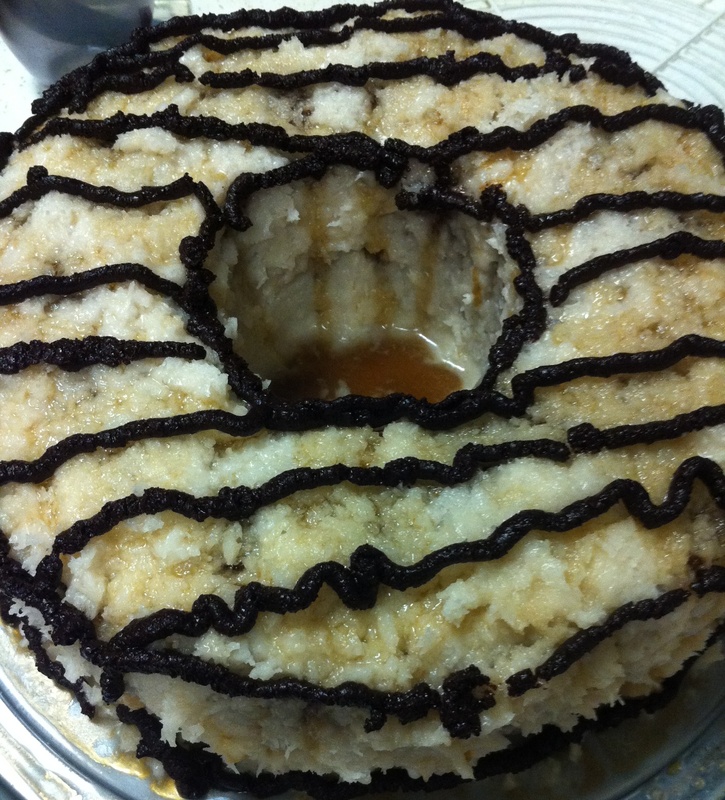 I found it easiest to use my hands to mold coconut over the entire cake. If it gets to warm it is hard to work with. In a sauce pan melt coconut oil over low heat. Once melted stir in brown sugar. Add milk and cook until sugar has dissolved. Slowly spoon caramel sauce over cake allowing it to drip down sides. It’s messy. Melt chocolate with milk. Put in a plastic bag (cutting the tip) or a pastry bag and decorated the top. Gallery | This entry was posted in dessert and tagged vegan girl scout cookie. Bookmark the permalink. This is completely awesome!!! Thank you for sharing your recipe with us! *Wipes drool off*. Wow, this looks amazing! I also just got caught up with your other blog posts revolving around the girl scout debacle. I’m glad that you guys stuck by your ethics and still found a way to contribute. I think you and your daughter are breaking down social norms in the best way possible and it is so great to see a family stand up for what they believe! Can you believe I didn’t even get to try the cake? Guess I’ll have to make it again with a few changes. 🙂 when we did this we weren’t really looking at the big picture but what worked for us. Now that the word is getting out there at least people know they have options! Thanks for following along!! This looks to die for! I am confused on one part though. Is it for one large bundt cake or three small bundt cakes. You say 3 cake pans. It’s a bit confusing. Thanks Kris. Typo. 1 bundt cake should be one pan. I would use a sweeter cake recipe. I added vanilla extract and sugar to make the batter taste more like cake. I also toasted the coconut longer to give it more color and flavor.